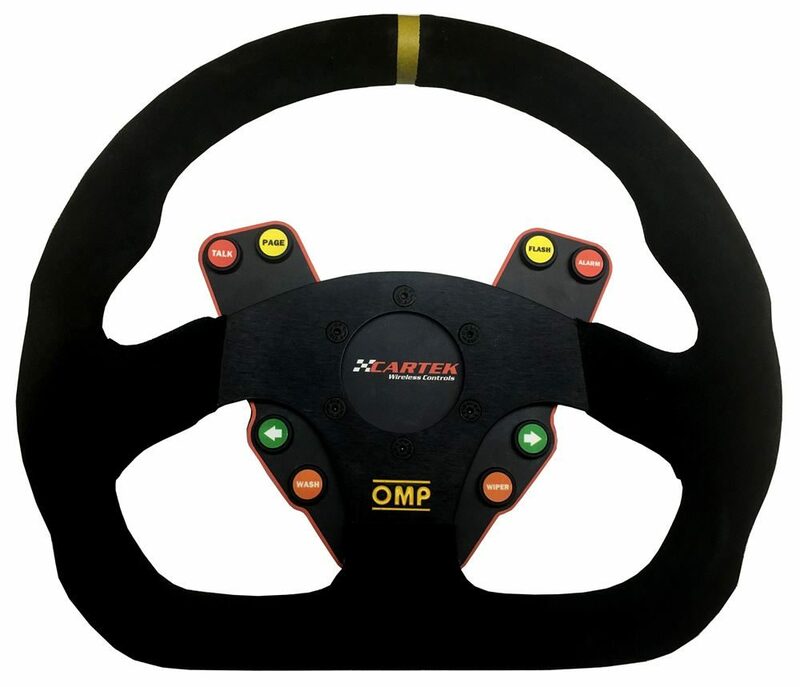 The Wireless Control System from Cartek is the quickest and easiest way to install pushbutton controls to a detachable racing steering wheel. 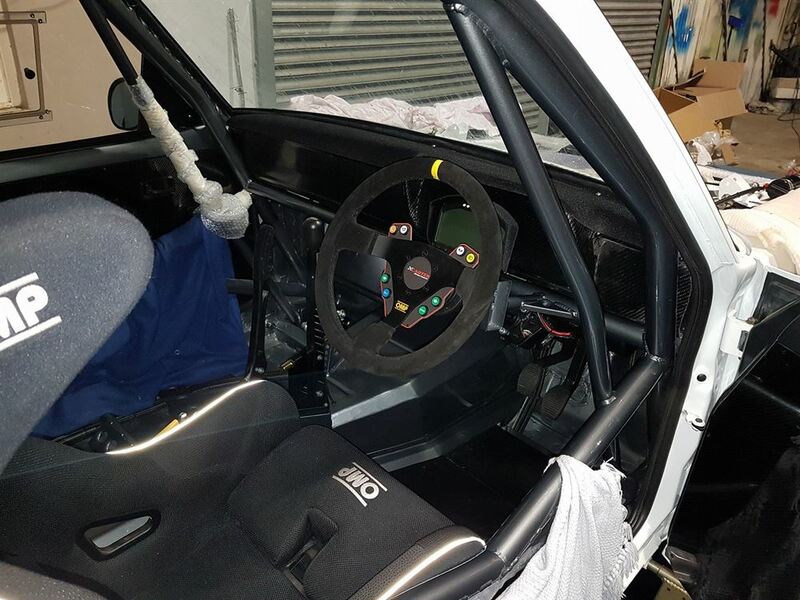 This innovative solution means users no longer spend time wiring in their own switches on to a custom fabricated panel, and do not have to contend with ‘curly’ cords or expensive steering wheel connectors that can damage very easily. 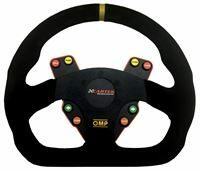 The complete system includes a universal steering wheel panel which incorporates 8 tactile switches and infrared transmitter module. 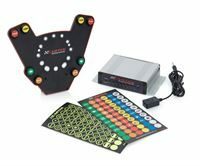 Also included is an infrared receiver, a relay control module which controls the functionality of each switch on the steering wheel, and 2 Sticker sheets allowing users to fully customise the buttons on the steering wheel. 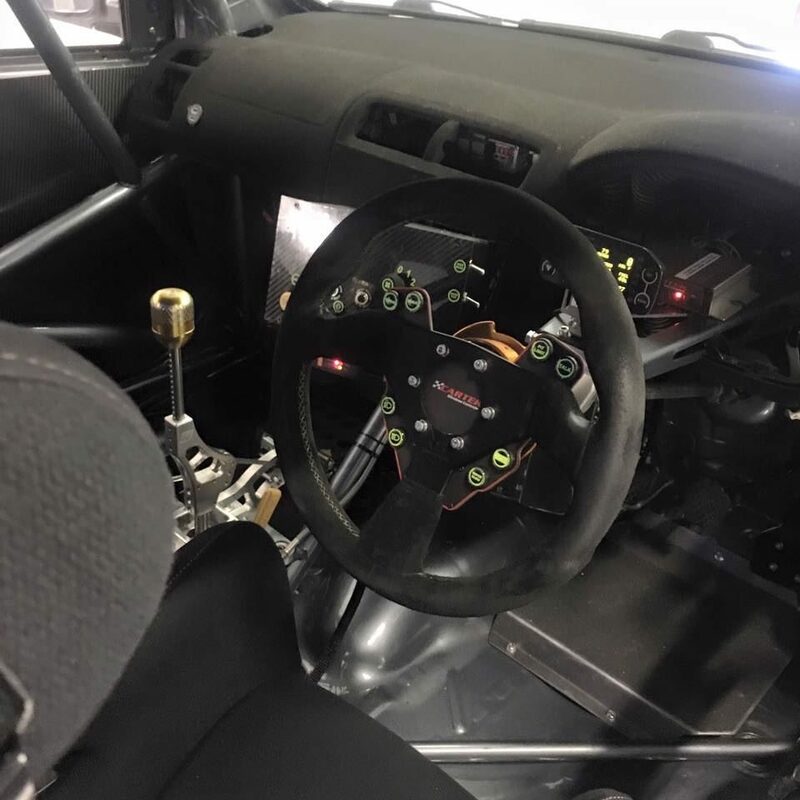 The Relay Control module provides a choice of push button functionality including momentary, latching and flashing modes for uses such as: PTT Radio, pit lane limiter, dash menus, lights, indicators, etc.. 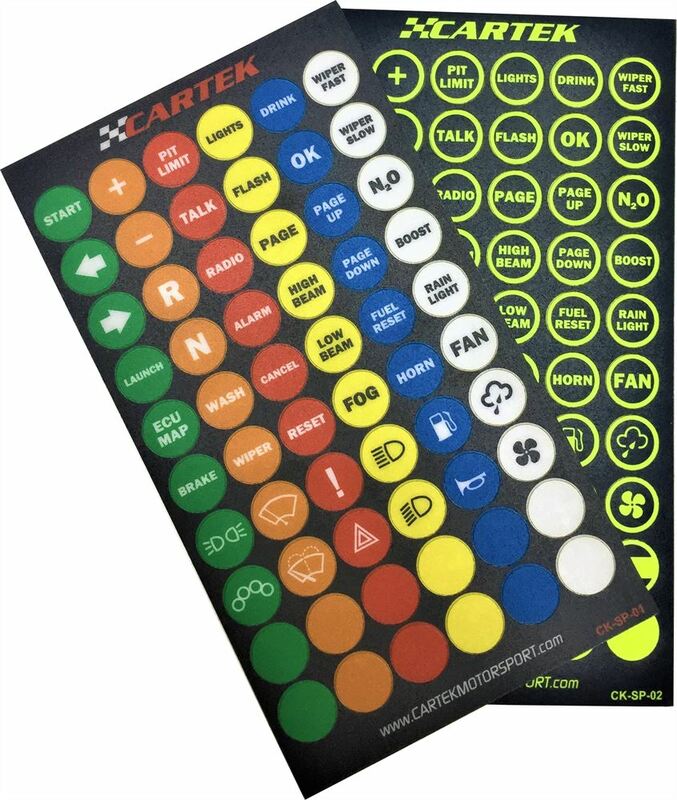 Appearance is customisable using the Multicoloured or UV Fluorescent label sheets supplied. 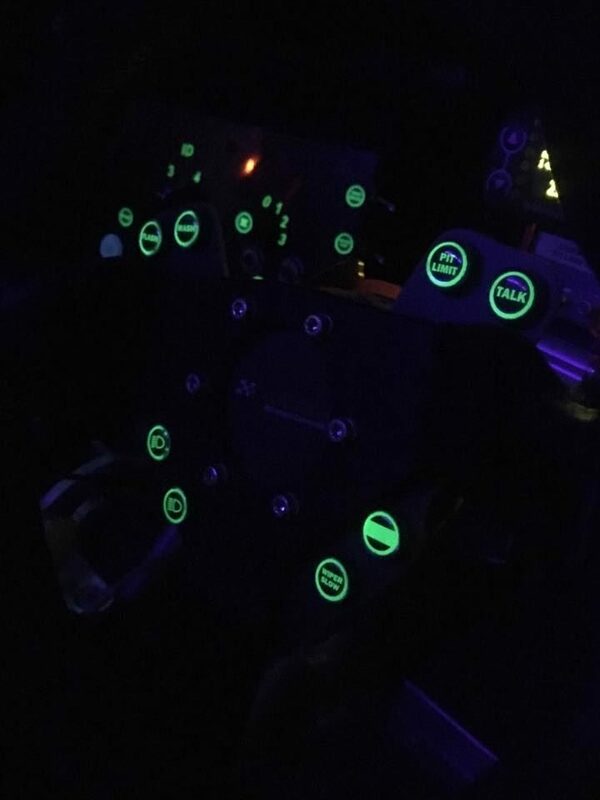 The fluorescent labels will glow at night when a low power UV light is installed in the cockpit. Infrared wireless link between steering wheel and dashboard designed to eliminate switching delays and external radio interference. Full 360° communication. Compatible with any make and type of quick release hub. 8 Independent relay channels (10A rated contacts). 0v or 12v switched depending on user requirements. 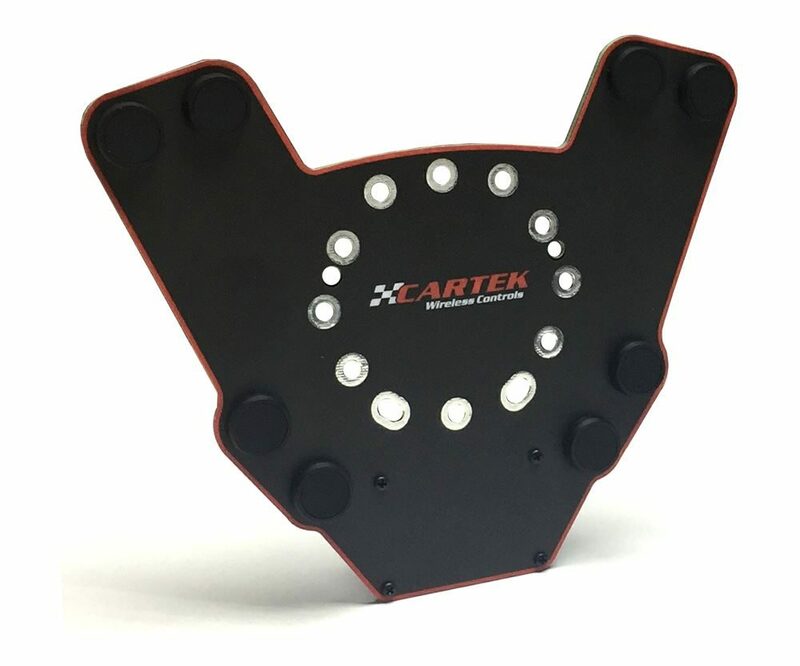 Relay Control Module communicates with vehicle electronics such as ECU, Dash, PDM, PDP-16, Radio or can be wired directly to control headlights/indicators etc. Fast response time, suitable for electronic gear shifting. Long battery life (approx. 3 years depending on usage). 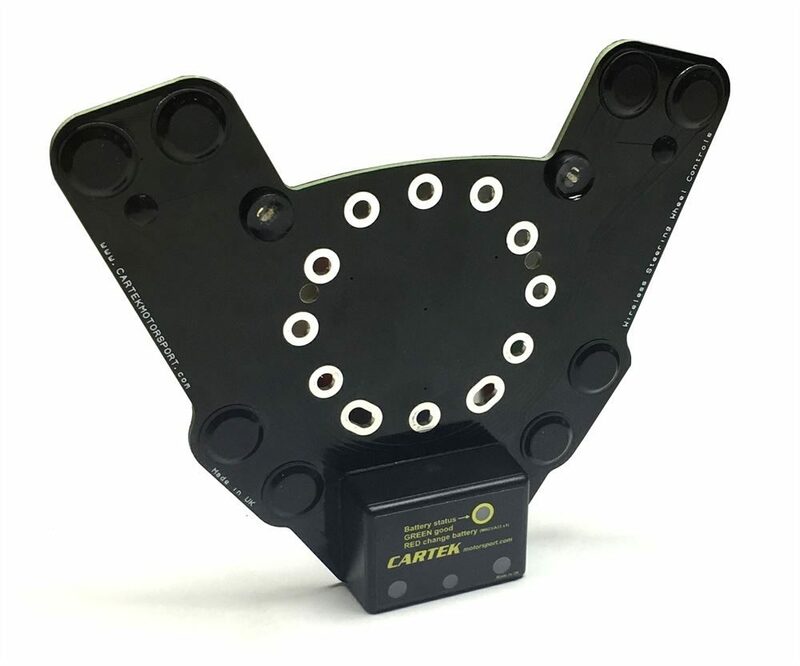 Incorporates battery test, easily replaceable. 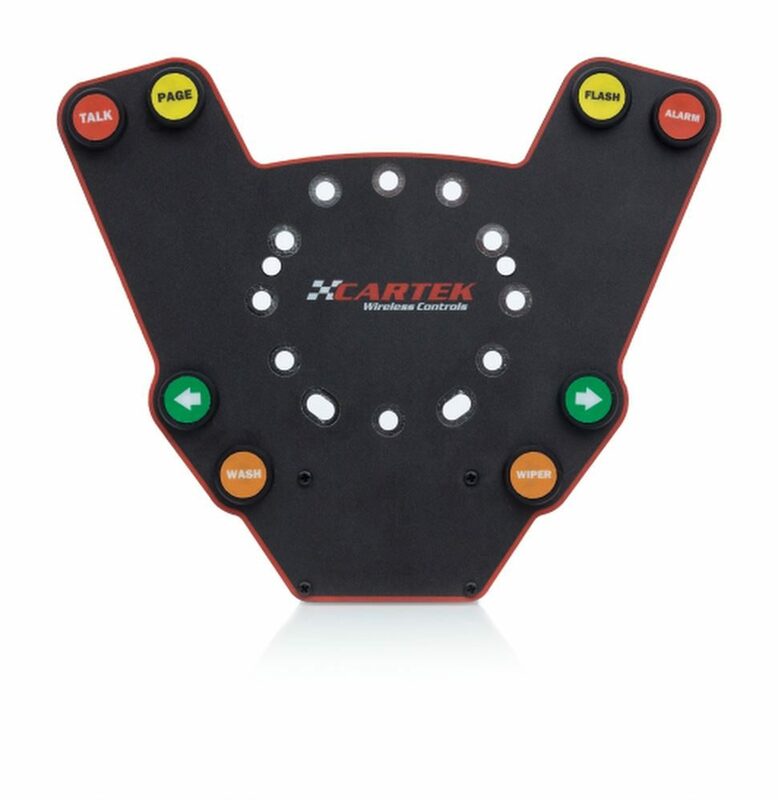 Cartek uses Infrared to communicate between the Steering Wheel and the Relay Control Module. 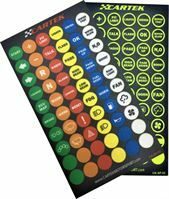 By using this technology, the wireless communication is completely protected from outside signals such as radio waves and EMF unlike other systems on the market. The system also allows the wireless link to be full 360 degrees. The infrared Transmitter module is mounted on the rear of the Steering Wheel Panel and is battery powered. The Transmitter only consumes electrical power when a pushbutton is pressed and therefore does not need to be turned off when not in use. When a button is pressed an LED on the Transmitter will show the status of the internal battery. If the LED shows Green then the battery is in good condition, if the LED shows Red then the battery needs to be replaced. Typically, the battery should last 3 years depending on usage. The Relay Control Module incorporates a status LED for each channel. Each relay channel can be wired to output 12v power/signal or 0v power/signal through its rear connectors (Relays rated at 10 A). 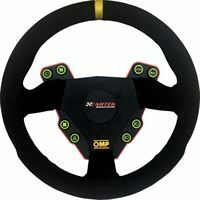 The Wireless Control System can be mounted to most racing and aftermarket steering wheels. 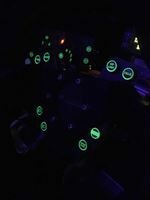 It now comes a multi coloured vinyl pack and UV Fluorescent vinyl pack (glow in dark under UV light) allowing full customisation of the steering wheel.